I’m teaching a pie class (sweet and savory) this Sunday, November 14. I am a bit evangelical about pie. 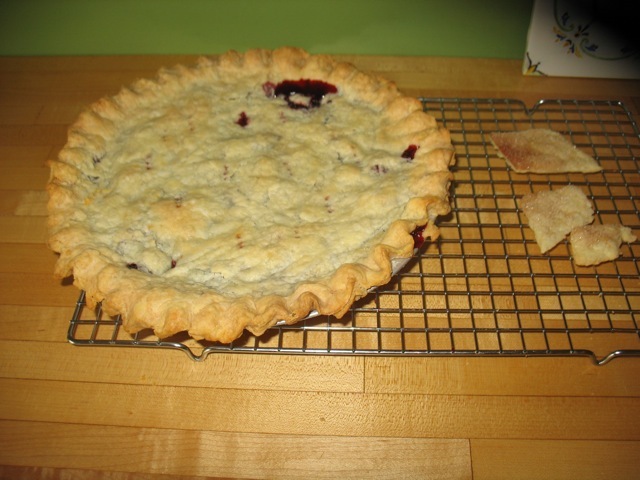 I love to bake most anything but there is something about pie that appeals to the minimalist in me. Just flour, butter and water for that crust and apples, a little sugar and thickener for the filling and the sum of those few things is just so much more than you’d expect. But there are a few tricks to pie and we’re going to tackle that all-butter pie crust and crimping those edges (that inevitably do sag in places when baked thanks to all that delicious butter!) and getting the filling cooked just right. 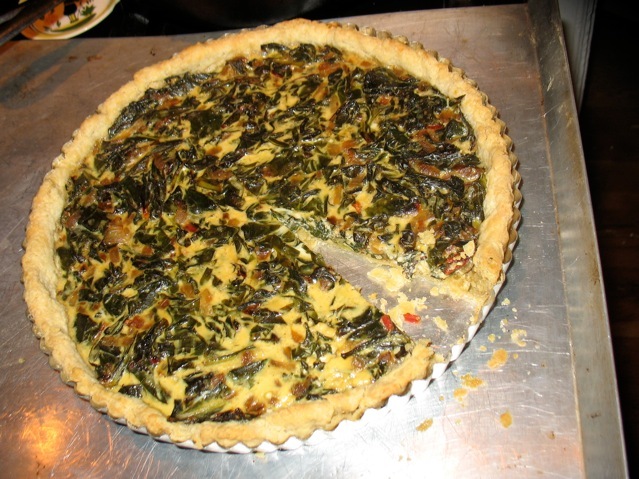 We’re going to fill those crusts with apples, pumpkin, and Swiss Chard and eat our results. And for all that hard work we’re going to be rewarded with eggnog–my grandfather’s recipe with bourbon, rum and nutmeg–and of course eggs, cream and milk–completely unrelated to the stuff in cartons at the store. My family (extended) has a thing about pies. At Thanksgiving, ever since I can remember, we’ve had a pie-eating contest. Slightly vulgar, I admit, but oh so fun and delicious unless you over do it and then you need a serious recovery period. Here’s a photo from last year’s pie (and tarts and cake) line-up sans my mother’s pumpkin chiffon and chocolate pies which were probably still in the fridge. Not a very good photo but I guess I wasn’t thinking about blog-worthy photos in the moment. I should add that the contest is not highly competitive and is informally held over many hours and tiny slivers (especially of rich things like pecan pie) count. There’s a lot more talk than actual keeping track. And since my aunt Jane (or her daughter Martha) almost always win it’s not much of a nail-biter. 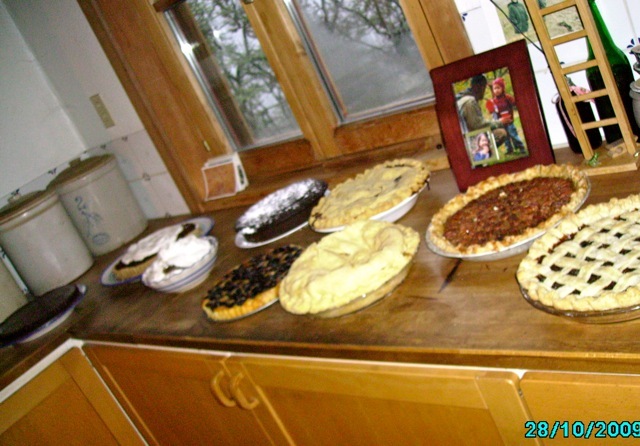 The sum total was 11 pies and tarts last year and we probably had 18 people for Thanksgiving. That is an obscene ratio! However, we all get to have pie for breakfast and lunch the following day and everyone gets to go home with a quarter of this and a few slices of that. And contrary to some opinions, misshapen, slightly soggy and less than perfect looking slices of pie are just as tasty or more so, than those pristine ones on day one! As you can see, Thanksgiving is not strictly limited to pie. My sister-in-law and one of my cousins and I always bring some other tart or cake we just have to try. Some of us read the same cooking magazines/blog and occasionally end up bringing the same new idea–a dense chocolate hazelnut tart one year and a pumpkin cheese cake another. My mother and my aunt Jane have their standards and there would be mutiny if any of those were missing. For Jane that’s lofty apple pies and dense, gooey pecan; for my mother it’s those pumpkin chiffon pies and chocolate pies with lots of whipped cream. Actually all the pies are served with lots of whipped cream–probably thanks to the heavy German influence of the bunch. I tend to contribute a traditional pumpkin pie, a mince pie (my favorite recipe is from the Grand Central Baking book), and apple pie or something like a pear frangipane tart. Speaking of not-so-beautiful: Rhubarb Pie never sets up well but is so good. It's much better to have a delicious pie than a beautiful pie, though the combination is unbeatable! So whether you can make it to class on Sunday or not, give pie a try if you’ve been hesitant and let me know how it goes. And if you have questions or want tips or have tips to share from your pie-baking adventures, leave a comment here. 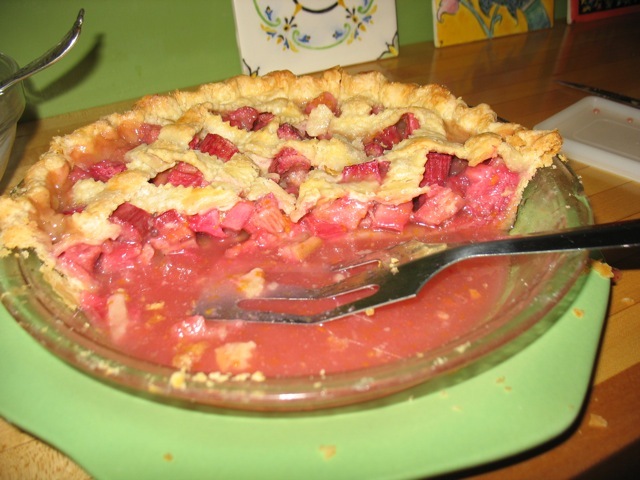 I can’t imagine spring without a strawberry rhubarb pie. Nom nom nom. I love the pie-eating contest. Your photos made me hungry. Instead of pie crust cookies, our good family friend and pie baker extraordinare would have her kids make what she called “nun’s farts” by taking circles of the excess crust dough, sprinkling them with cinnamon sugar, folding them over and baking alongside the pie. Have you tried swapping out ice water for vodka? Cooks Illustrated recommends doing so, but I keep forgetting to try it. Deb at Smitten Kitchen has a whole thing about that and she ended up back with ice water. I love my crust actually and Deb’s piece on pie (it Pie 102 on her blog i think) totally affirms all of the things I’ve settled on. Right. And why mess with perfection? I’ll save my vodka-tonic for pre-pie festivities.